Browse: Home / What Credibility Rating do you give this story? Remember that red helicopter that landed dramatically on the grass around 2.50 pm, in front of the H. of C. with the Freemasonic symbols on it? It was around the time that PC Keith Palmer was dying (supposedly) of stab wounds? Nobody got out of the helicopter did they? Then it took off again some ten minutes later, didn’t it? Meanwhile the ‘hero’ MP Tobias Ellwood was pumping the chest of the dying K.P. (worst thing to do when someone is stabbed in the chest) trying to resuscitate him, while other medical experts stood around him and watched…remember? Do doctors do that? In the street? We got no hint of this a year ago, did we? It’s a totally new story. 2. Sounds unlikely, but if the papers say so…. I’d like to focus on what is perhaps the most dramatic part of the narrative, viz the dying moments of PC Keith fletcher. 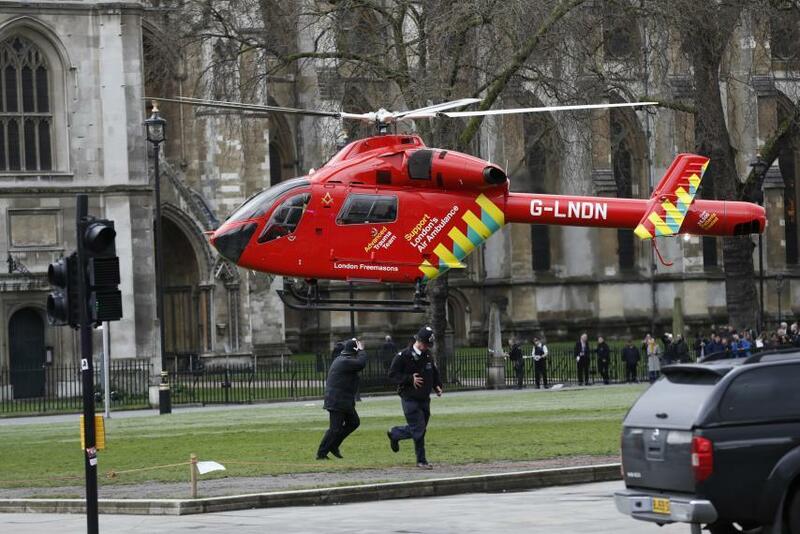 At 2.50 pm a red helicopter landed on the grass of Parliament Square, and this was around the time that PC Keith Palmer was dying (supposedly) of stab wounds? We saw pictures of the ‘hero’ MP Tobias Ellwood pumping the chest of the dying policeman. Later on he recollected how he also tried to give mouth to-mouth resuscitation, to no avail. Various police and medical personnell were standing around watching him. Eventually a doctor said there was no hope, and Ellwood recalled, “I remember looking at him and saying, ‘you’re going to have to tell me to stop, sir, because otherwise I’m going to keep doing this. '” What a hero, no wonder he was promoted to being Ministry of Defence Under-Secretary a few months later. Come the Inquest, the story changes to: the red helicopter is ‘London’s Air Ambulance’ and upon landing two medical personnel leapt out of it, crossed over the road into the House of Commons, swiftly set up a blood-transfusion for PC Palmer, and then opened up his thorax by cutting though some rib-bones, and ‘one of the doctors then grabbed the heart directly and started squeezing it.’ That has to be the spectacular finale of the now re-told story. It is perhaps rather humdrum to say that no-one can be given an intravenous infusion if the heart has stopped beating. But the main point, surely, is that no trace of this narrative existed in the earlier and original version. 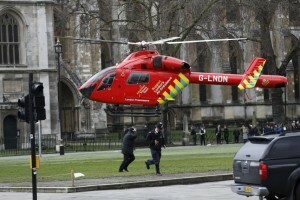 Given that the helicopter landed at 2.50 about eight minutes after the event, we could be forgiven for assuming that its passengers hardly had time to grab their jackets, let alone bring a pint of warm blood with them suitable to go into PC Palmer: they would hardly have had any time to be briefed as regards what had happened. The original narrative had no suggestion of an ambulance next to PC Fletcher, or that he was taken into one. We’re now given what sounds more like an Aztec sacrifice than a modern emergency procedure. There would have been huge pools of blood around, on the cobbled courtyard: whereas we saw no drop of blood, even the two knives left lying on the ground had no blood on them. PC Palmer was wearing a protective shirt, made of chain-mail, the Inquest was told. We were shown images of the attempted stabbing, which could not however penetrate the chain mail, and were told how the assassin had to stab under the arm and in the neck, in order to avoid the protective vest. He did all this while holding two knives. It is not easy to picture the various heavily-armed police officers standing around while this was happening. At the Old Bailey, in September of 2108, a month-long Inquest was held reconstructing what had happened on Westminster Bridge in those brief few seconds. It used the same lawyer Hugo Keith as we saw earlier for the 7/7 Inquest. It all seemed very impressive, with lots of witnesses testifying. Perhaps the most basic concept in the story, was the notion of having a car drive up onto the pavement of Westminster Bridge and drive along it. All the papers had images of this deeply shocking trajectory, right along the bridge. But, come the Inquest, it had changed: now the car surges up onto the pavement, drives twenty yards, then comes off it in order not to knock over the yellow sign on the pavement. It then leapt back onto the pavement again and continues – tossing pedestrians here and there, onto the road and into the river. But, can the story really be changed in this manner? Could that change have resulted from objections to the narrative as given, eg myself with the ‘Kent Freedom movement’ duo doing a video on Westminster Bridge a week after, and pointing out the manifest impossibility? If a deranged ‘terrorist’ was surging along at thirty miles per hour on the pavement –so the inquest was assured – slamming into pedestrians here and there, then why would it have bothered about a light and flimsy street sign, that would easily have been knocked out of the way or flattened? Clearly the answer here has to be, because it was still standing there after the event. I believe it’s true to say that no journalists even mentioned that street sign when reporting the event, or at least did not suggest that it posed any impediment to the narrative. A made-up story can always be changed and I suggest that has happened here: somewhat as, for example, the inquest on the Lee Rigby event switched the whole manner in which a car allegedly impacted into him, in response to online criticism. Initially the car is meant to have mounted up onto the kerb just as it impacted Kurt and Melissa Cochran at the southern end of the bridge, allegedly travelling at over thirty miles an hour. Kurt was hurled right over the bridge and landed far below, at the bottom of some steps. They were just by a tourist kiosk, and the last traffic light is just before that: so turning left out of the traffic, going uphill and mounting up onto a 3-4 inch pavement I really could not see how it could have been doing more than ten miles per hour (Londoners may wish to visit this spot and decide for themselves). It could have impacted the couple, but not hurled them anywhere.